There are many methods of starting new plants, but some plants only respond to certain methods. Such is the case with both cyclamen and begonia. Cyclamen is particularly difficult to propagate, even by seed, the only method experts recommend. Begonias are easier to propagate, responding especially well to leaf and stem cuttings. Which of these methods you choose to use depends largely upon your personal preference. 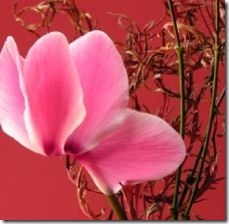 Professional growers propagate cyclamen exclusively by seed, says the Clemson University Extension website. However, cyclamen seeds germinate slowly and erratically, and it takes 9 to 15 months to create blooming, full-sized plants from seed. According to the North Dakota University website, cyclamen seeds are found only in fertilized blooms where the stem doesn’t wilt after the flower fades. Harvest the seeds just before the seed capsule opens, or place a brown paper bag, tied on with string, to capture the seeds when the capsule bursts. Good cyclamen seeds are light brown in color. In a small bowl, mix warm water and a pinch of detergent. Allow the seeds to soak in this mixture for 24 hours. Fill 6-inch deep containers with starting medium. Sow the cyclamen seeds about 1/4 inch deep and 3/4 inch apart. Keep the seeds in the dark and don’t allow the temperature to drop below 55 F or rise above 60 F.
Select only healthy young sections of the begonia for cuttings, since they will root more readily. Using clean hand pruners, cut a stem 2 to 4 inches long just below a node, leaving the leaves attached. Remove any leaves from the bottom 1 1/2 inches of the stem. Dip the cut end of the stem in rooting hormone, then in a pot filled with starting medium. Some types of begonias also root if you place the hormone-dipped end in clean water. Select a leaf that has a main vein and remove it from the mother plant with clean hand pruners. Dip the cut end in rooting hormone and then in a pot filled with starting medium. Division is another possibility for propagating both cyclamen and begonias, but according to the website for Edgewood Gardens, a respected private garden in Pennsylvania, propagating cyclamen by division is troublesome. The plant’s rhizomes tend to rot when cut. The same issue is often a problem for begonia. Nevertheless, if division is desired, look for growing points, or nodes, on the rhizomes. Each cut piece of rhizome must have at least one. Then bury the rhizomes in starting medium. Lack of adequate drainage is a common reason propagation by cutting or division fails. Therefore, in addition to sterilizing containers with hot water and soap, make sure all containers have plenty of drainage holes. The Washington State University Extension’s website recommends equal parts peat or sphagnum moss and sand, perlite or vermiculite as a good starting medium for seeds, cuttings and divisions.